Birds are associated with Christmas. Robins are a favourite on Christmas cards and turkey, geese and chickens are all feasted on. The traditional carol “The Twelve Days of Christmas” features an array of birds most of which would have been eaten at this festive time. There are many versions of the carol. First published in English in 1780, the carol is thought to originate from an earlier French version. The pear tree referred to in verse one, it has been suggested, is perdrix. French for partridge and pronounced per-dree and was simply copied down incorrectly when the oral version of the carol was written down. 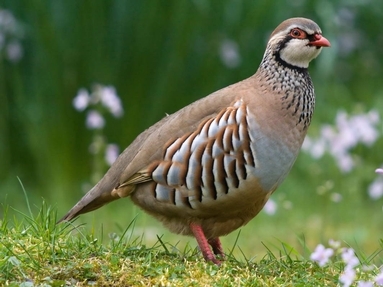 If the “partridge in a pear tree” is taken literally it is more likely to have been a Red-legged Partridge (French) which more readily perches in trees rather than the native Grey Partridge. The Red-legged Partridge was successfully introduced into the UK around 1770. The two Turtle Doves would have been unseasonal wild birds but could well have been caged and are known as emblems of devoted love. The three French hens probably refer to domestic fowl a still popular food. The four calling birds, it is suggested, refer to four colley birds. That is four Blackbirds, colley meaning black. You traditionally need “four and twenty” for a pie but by the end of the carol you would have thirty, six more than enough for a pie! Five gold rings could refer to five “gold spinks” or Goldfinches, another popular cage bird. Another interpretation is that it refers to ring necked birds such as pheasants, another popular table bird. Six geese and seven swans refer to birds that would have eaten at the time the carol was written. In the later verses, could the drummers drumming be Common Snipe and the pipers piping be another wader like a sandpiper or an Oystercatcher? By the Twelth Night the table would have been heaving with 12 partridges, 22 doves, 30 hens, 36 blackbirds, 40 pheasants, 42 geese, 42 swans etc etc and after that I would be surprised if the lords would have had energy for leaping or the maids for milking.